Summary: This is my favorite chest exercise because it doesn’t require any weights, is easy to learn, has a number of interesting variations, and is super effective. How to: Typically you start out laying face down, legs together, arms a little wider than shoulder width apart. You can start as depicted below where your arms are extended and then gradually bend your elbows letting your body come a couple inches from the floor, and then extend your arms (pushing up) back up to the starting position. Summary: This is a very good exercise that works your chest and shoulders to some degree. It can be done on a flat or incline bench. How to: Pick up your dumbbells one in each hand and start out just above the level of your body with your arms bent. Now press the weight up exhaling then bring them down to the starting position again. Don’t use weights that are so heavy that you cannot lift them from the floor into the starting position. Do 8 – 12 repetitions and maybe 2 or 3 sets and you are good to go. 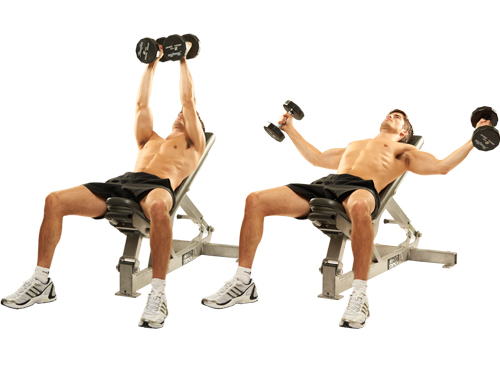 Summary: The Dumbbell Fly can be done on a flat or incline bench. This exercise stretches your pectorals and can held develop the inner as well as the outer chest muscles. 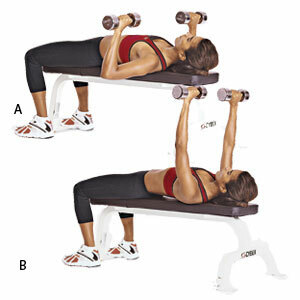 How to: Pick up your dumbbells one in each hand and raise the dumbbells up together as depicted below. Now lower them in an arch to about the level of your body, and raise them in an arch exhaling back to the top starting position. Note you usually cannot use as much weight when doing a Dumbbell Fly as when you are doing a Dumbbell Press. Using too much weight can compromise your shoulders.